I could’ve written about this before, as I saw it on TV a few years ago…but I didn’t think about mentioning it on my blog until now. There’s a small rural farming town in 青森県 (Aomori Prefecture, Japan) called 「田舎館村」 (“Inakadate-mura“). The town’s name actually means “Countryside Palace Village”…so you know it must be a small town with a name like that! There’s not much in that town except rice farms. 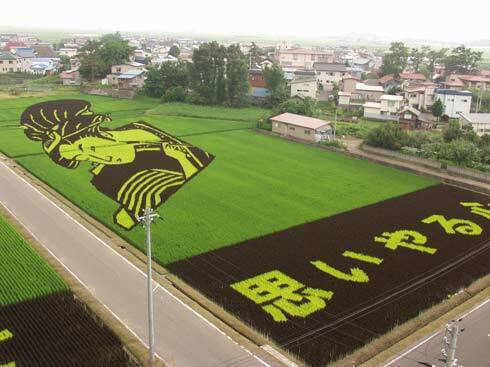 So in an effort to bring revenue to the town, a number of years ago the townspeople decided to work together and turn one of the village’s largest rice field’s into a work of art. 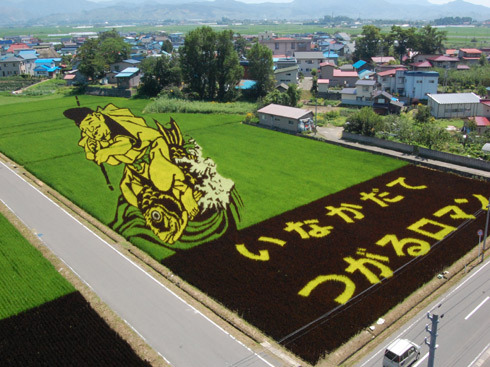 It was an immense amount of work to do it…but they hoped that their effort would boost sales of the village’s rice and maybe even bring tourists to the town to see the decorated field. Well, their hard-work paid off. 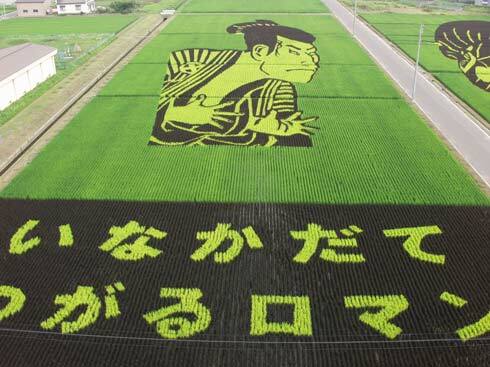 People from all over Japan made the trip to 田舎館村 (Inakadate-mura) to see the amazing rice field…and sales of their rice has increased as well. 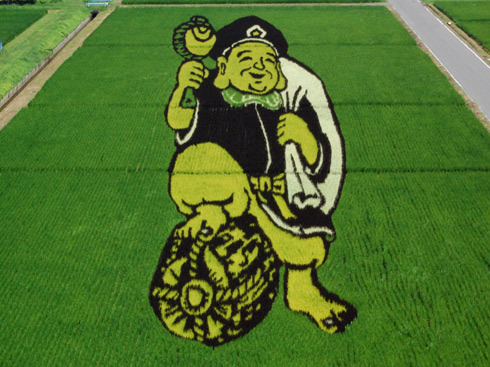 The town’s population is only about 8,700 people…but 150,000 people went to see the rice field art! 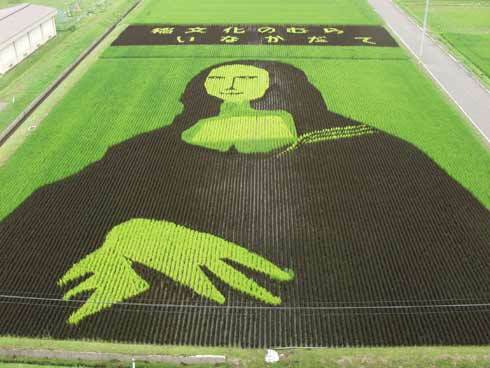 They make these unbelievable works of art by planting different types of rice plants that have foliage of different colors…but not until painstakingly planning where each and every seed will be planted! 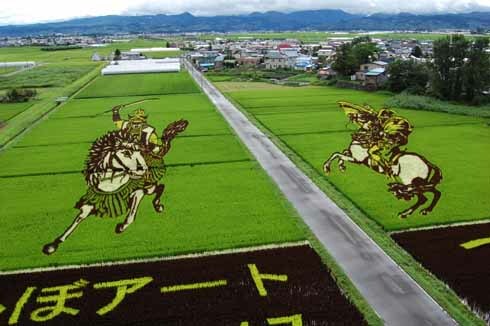 It was alot of work, and the artwork in the rice field only lasts about three or four months…but due to the immense success, the town continues to make a different picture in the rice field every year. 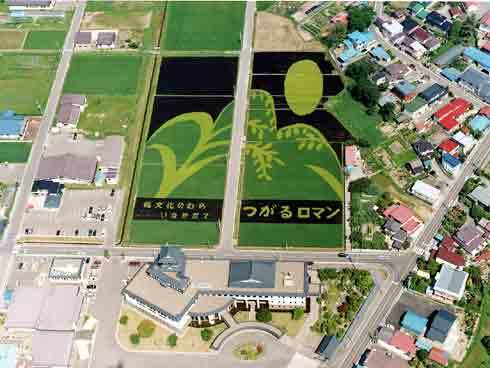 The rice artwork in Inakadate-mura from summer 2002. Great post! Thanks for sharring! Beautiful work but it must be very time consuming. do they pay artists to do this? The townspeople worked together to help their own town. I just wonder if the different types of rice have slightly different flavors. Japanese are generally very good at ‘tasting’ different types of rice, unlike my western palate which can’t detect these subtle differences. If the rice does taste different, it must be a helluva job picking out the different grains! 😉 Or do they just blend them all together? I don’t think harvesting it is as much work as planning and planting where each plant should go to make the artwork! For the most part, each of the rice types are in groups…so I’d imagine keeping them separate when picking them is probably extra work, but not impossible. thank you for putting the ふりがな up! its very useful 🙂 i’ll be sure to make more comments in the future, for now i’m enjoying all your old posts which I have not read yet. And I look forward to reading you comments. just thought I would let you know, I now have an account, so you’ll be hearing more from me in the future I’m sure! I just looked at your site. My sister-in-law recently sent me an email about this, with the same pictures you have on your blog and was asking about it – I didn’t know then, but now I know. >I didn’t know then, but now I know. Did you learn about it from my blog? >Have you seen this in person? No. It’s too far from Tokyo to make a special trip…but if I ever go to 青森県, I’d consider passing thru 田舎館村 to see the field (if it happened to be late Summer / early Autumn…when the crops have grown). I think it’s wonderfully cool…but man, what an effort and expense for a temporary piece of art. >what an effort and expense for a temporary piece of art. Japanese people believe that a full effort should be given for any job…even if it’s “temporary”. (That’s why haircuts, meals, etc are always done perfectly in Japan). I didn’t who that is…so I “Googled” him. He’s an artist who specializes in “temporary” art. OK, I see. I just read that he has done work in Japan before. Beautiful art. But how can people see the overall design when they visit up close? Is there a tower where they can see the design? Yes, there’s a nearby tall building where people can go up to the observation deck and see the whole field. I’m quite new to the blog, and i really love it! I study japanese at university, and so am always interested in new kanji. Now, it may just be me but, the ふりがな on this post wasn’t showing up >.<! Thanks. Please visit my blog often…and comment anytime. I guess I forgot to add it when I wrote this post…I just added it. Speaking of art…the new Ace Frehley album is released tomorrow. I’ve listened to the streaming version. I must admit that the first 3 or 4 songs leave me pretty cold. When he hits the cover of FOX ON THE RUN though, the album really takes off. I enjoy the rest of it quite a bit. As far as KISS members solo releases…I only have both of Gene Simmons albums, both of Paul Stanley’s, one of Peter Criss’, two ESP albums, and two of Ace Frehley’s. I’ll only get his new one if I hear it first myself and like it alot.